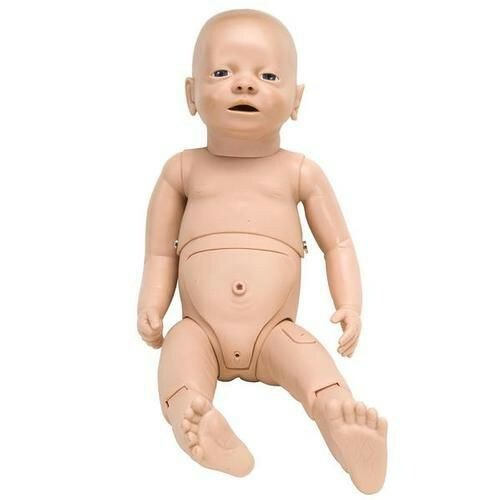 Nurse Training Baby Manikin, by 3B Scientific, is an advanced, high-quality anatomical model with both interchangeable male and female features, including internal organs, a removable belly covering, genital organs, soft ears, as well as fully movable head, arms and legs. The model allows students and trainees to practice both basic and infant care without the risks that come with practicing on an actual human infant. The Nurse Training Baby Manikin model features a syringe, a suction catheter, a feeding tube, urinary catheter, urine collection bag, catheter lubricant, and carrying bag, all to fascilitate training. Made from the quality materials that have made 3B the leader in anatomical models, this Training Baby model is an excellent choice for any hospital or classroom. Vitality Medical also carries other anatomical models and educational supplies, such as the Patient Care Manikin and the I.V. Injection Arm Injector Trainer. Includes Both Male and Female Features. Internal Organs (Heart, Lung, Intestine System, Stomach, and Bladder). Fully Movable Head, Arms, and Legs. Includes Syringe, Suction Catheter, Feeding Tube, Urinary Catheter, Urine Collection Bag, Catheter Lubricant, and Carrying Bag.